"No need to soak these beans! Very simple. 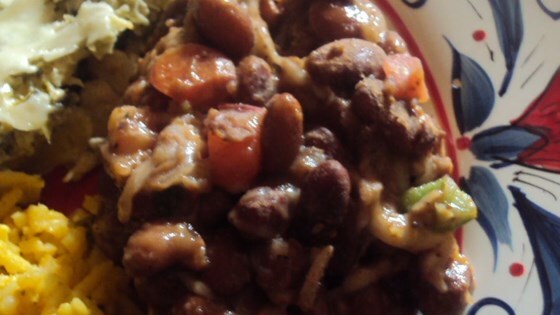 These pinto beans are somewhat like refried beans without the frying. They are creamy and easy to make in no time. No messy clean up with these beans"
Combine water, condensed chicken broth, beans, garlic, onion, and crushed red pepper flakes into a large saucepan; season to taste with salt and pepper. Bring to a simmer; cover. Cook, stirring occasionally, until beans are soft, about 3 1/2 hours. You may need to add additional water to keep the beans from drying out. Mash cooked beans with a potato masher to desired consistency. Stir in mozzarella and pico de gallo before serving. This hearty, spicy bean stew is so easy and totally delicious. More like 6 hours for soft beans, with the 2 minute boil and 1 hour rest. The amount of salt in this recipe has been corrected. Not only was this super easer, but really good. I probably only used about 2 tsp of salt for the whole pot. I didn't even bother mashing them, just served them as is.